Accessibility to healthy foods makes it easier for us to be proactive about our health. And unfortunately, for some of us, a lack of money means a lack of accessibility to healthy foods. “When incomes drop and family budgets shrink, food choices shift toward cheaper but more energy-dense foods. The first items dropped are usually healthier foods – high-quality proteins, whole grains, vegetables and fruit. Low cost energy-rich starches, added sugars, and vegetable fats represent the cheapest way to fill hungry stomachs,” according to the National Institutes of Health (NIH). So not surprisingly, Whole Foods, a top-of-the-line grocery market chain often referred to by many as “Whole Paycheck,” is usually not a shopping destination for people with tight funds. 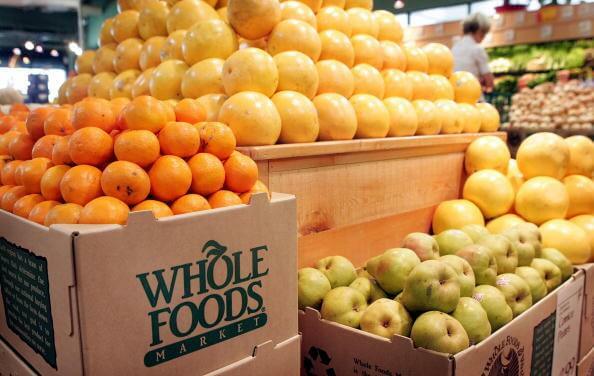 But with Amazon’s reportedly $13.7 billion acquisition of Whole Foods, prices are getting lower at these luxury grocery stores full of some of the best, organic produce and products. For example, at a Whole Foods in Manhattan prices of key items including bananas, organic Fuji apples, organic large brown eggs, organic rotisserie chicken and more were reduced. Bananas went from 79 cents per pound to 49 cents per pound, which is a reduction of 38%! Hopefully, this trend of making healthy foods more affordable, and therefore more accessible, will continue throughout the U.S. Eating healthy foods is one of the best ways we can be proactive about our health on a daily basis. “For hypertension, CHD [coronary heart disease], and stroke, there is convincing evidence that increasing the consumption of vegetables and fruit reduces the risk of disease. There is probable evidence that the risk of cancer in general is inversely associated with the consumption of vegetables and fruit. In addition, there is possible evidence that an increased consumption of vegetables and fruit may prevent body weight gain,” according to the NIH. And what people may not realize is making healthy food more affordable and lowering the incidence of chronic disease may actually save a lot of money. It is expensive to care for sick people. Eighty-six percent of the nation’s $2.7 trillion annual health care expenditures are for people with chronic and mental health conditions. Total annual cardiovascular disease costs to the nation averaged $316.1 billion in 2012–2013. Of this amount, $189.7 billion was for direct medical expenses and $126.4 billion was for lost productivity costs (from premature death). In addition to eating healthy foods, we also have to make sure we are getting an adequate intake of certain nutrients from these foods, so as to help prevent these diseases. Magnesium. There is some evidence that magnesium may reduce the overall risk of cancer. In one study, researchers found that the group with the highest magnesium intake seemed to have the lowest overall cancer risk, while the lowest magnesium level group carried a higher risk. Foods containing magnesium include spinach, pumpkin seeds, yogurt, kefir, almonds, black beans, avocado, figs, dark chocolate and bananas. Selenium. Selenium may be protective against cancer, and a deficiency in this important mineral may be a risk factor for several types of cancer. Foods high in selenium include Brazil nuts, yellowfin tuna, halibut, sardines and chicken. Calcium. Adequate calcium may decrease your risk for colorectal cancer. Recent studies confirm that high calcium intake is associated with a lower risk of colorectal cancer among both men and women. Maintaining the correct levels of calcium in your system may also reduce your risk for breast cancer. For foods rich in calcium, click here. Zinc. People with increased dietary zinc intake may have a lower risk of lung cancer, a study suggested, noting the protective benefits of this mineral. Lamb, pumpkin seeds, grass fed beef, mushrooms, chickpeas, spinach and chicken are possible sources to get more zinc in your daily diet. Copper. People with increased dietary copper intake may have a lower risk of lung cancer, a study suggested, noting the protective benefits of this mineral. Copper rich foods include sunflower seeds, lentils, almonds, dark chocolate, beef liver and asparagus. Iron. Increased iron intake may also help protect against lung cancer. However, excess iron intake can cause other health problems. Iron-rich foods include red meat, pork, poultry, seafoods, beans, spinach (and other leafy greens), peas, cherimoyas and iron-fortified cereals. Let’s take on this journey for optimal health together and support Amazon, so that they will be inclined to further reduce the price of other healthy foods. And did you know that you can use your purchases at Amazon to support your continued use of healthy information from Proactive Health Labs? Just choose AmazonSmile each time you make a purchase and select Proactive Health Labs as your charity, and Amazon will donate 0.5% of your purchases to our organization. With your donation, we will be able to continue providing you with healthy information for many, many more years..